Strangely my power supply died suddenly and without warning. I turned it on one morning a few days ago and there was no power to the motherboard, but the little orange light at the back of the power switch was lit up. I double checked the PSU was at fault by removing it from my system and hooking up a fan, and shorting the power on cable with a ground cable to force it to start up. Nothing. It's a Hiper Type-R 580W by the way. I'm skeptical that it really is dead because its been working flawlessly since I've got it, and it just suddenly stopped working for no reason. It didn't make any worrying noises when I turned it on, and theres no burning smells. It says in the manual theres an internal fuse, it would make sense that this has blown, but it also says it will only blow if theres a serious fault with the thing, and I'll have to peel off the warranty sticker to open the thing up, but I really cant be doing with sorting out a replacement! In my experience, replacing the internal fuse will fix it 9 times out of 10. Unplug and turn of power switch. This will usually reset it if it had a high current draw. green to black will turn on the supply. It could also just be dead. If it is under warranty, I would not open it up at this point. Thanks for the replies. How easy would it be to replace? I tried what you said Samuknow, didn't help. Last edited by Chaz; 14th June, 2007 at 06:20 PM. 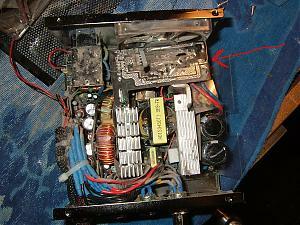 The fuse may be soldered in place. That can make it more difficult. If you are going to open it up, be VERY careful. The large caps can be deadly if they are not discharged. If I do open it up and remove it, what should I replace it with? 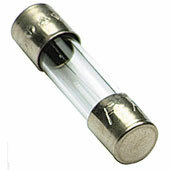 A fuse of the same capacity. Oh, so a typical fuse you would wire into a plug will do? I just guessed it would be different. It is probably a glass tube type. The type that used to be used in older cars. They are still used in electronic equipment. Right, I've opened it up. Having a look around I found something that looks fuse like but I'm not sure its the right bit, see attached pics. What I'd expect to see is a quick blow fuse, which would look like the attached photo. You will have to use a fuse of the exact same type, as the blown one. I can't see the photo so clearly, but that could be a fuse you've pointed out. Does it look like it has been covered in shrink wrap or something? Yep, that's the fuse. Looks like it has been covered with heat shrink, too. They've taken to doing that as a safety precaution, because very occasionally a fuse can actually explode, and then there are potential issues with arcing. Do you have a DVM? volt meter ohm meter. You can measure to see if it is open. Thanks for the help. I cut a slit down the heat shrink and peeled it back, it's definately a fuse. But looking at it closely I can see the wire through it, with a blob of something in the middle, it's probably not a very good indicator of whether its blown or not but it looks as if it hasn't. 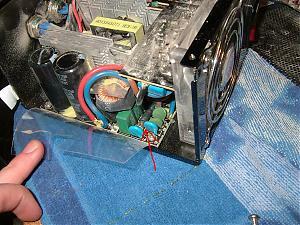 Does that fan on it still work? Last edited by robbie; 15th June, 2007 at 01:38 AM. Well I took the fuse out, put it in a simple circuit and it worked fine. The fuse hadn't blown. I guess there's nothing I can do then? It's making me very nervous lol. Agree, I mentioned this earlier. Time to buy new stuff. Oh well, that's life. I don't think theres anything to be worried about, the half lives of capacitors this size are fairly small, there won't have been an ounce of charge left in any of them by the time I opened it up.